MojoTech welcomes new additions to both the Design team and the Engineering team! Jesse always knew he was going to be some type of designer early on in life when he used to draw comics for fun. He eventually obtained a degree in Graphic Design and still draws comics from time to time, but now with better typography. Jesse has had the pleasure of working with various companies in all facets of design, from identity design to marketing campaigns. Halsey hails from just outside New York City. He graduated from WPI with a BS in Chemical Engineering and a minor in Computer Science but ultimately decided that CS was his true calling. When he's AFK he practices a variation of mixed martial arts called REaCT (invented by his coach). Some of his other interests include photography, traveling, being outdoors, writing and recording music, and finding new and exotic types of coffee. 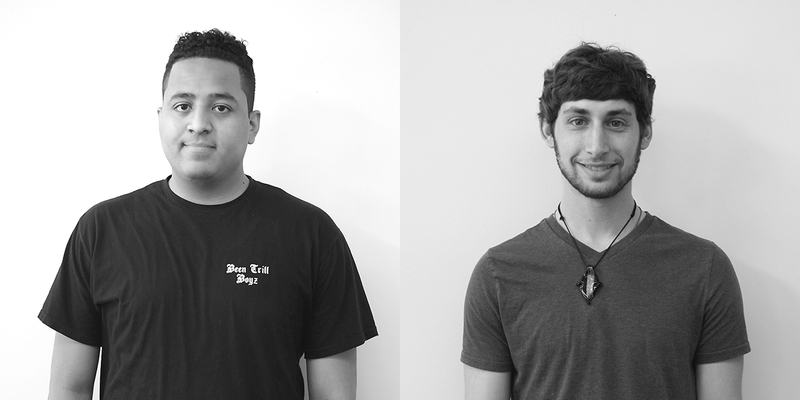 Read on to learn more about our newest Mojos. Jesse: I went to Rhode Island College and earned a bachelor's degree in fine arts with a concentration in graphic design. Before working at MojoTech, I worked at a marketing and branding agency and before that I worked various jobs from fast food to cell phone sales while studying. Halsey: I graduated with a BS in Chemical Engineering and a minor in Computer Science from Worcester Polytechnic Institute. I supplemented the coursework I did for my minor with coursework online to build up my programming skills, and have since been developing web, desktop, and mobile apps, and doing UX/UI design for multiple platforms. Jesse: This is a tough one, but I think the most interesting project I’ve worked on has to be a re-architected government website that had to meet all the needs of a tremendously diverse set of users who visited the site. Government work gets a bad wrap for being boring, but this project presented very challenging design problems to solve that I had not experienced before. Halsey: The most interesting project I’ve built was definitely a Java app called Sonify, which uses a custom algorithm to map different parts of any chemical spectra to musical notes. The notes can then be combined, edited, and played back to create songs. The interface is based off a traditional DAW like Ableton Live. The program was designed for students as a learning device to generate interest in molecular chemistry through musical composition. 3. What do you enjoy most/least about engineering or design? Jesse: What I enjoy most about design is that you notice all the effort and problem solving that goes into things we use every day, most of which goes unnoticed by the general public. It’s like speaking a secret language. My least favorite thing about design is having to explain what I do to people who are not familiar with it, or have certain misconceptions that design means "making things pretty". Halsey: I definitely enjoy the absolute freedom that comes with software engineering. From almost nothing, software engineers can create whole worlds and technologies that were once unimaginable! 4. What personal characteristics do you feel are necessary in order to be a successful engineer or designer? Jesse: Curiosity. In my opinion, most things that make up "good design" can be learned but you have to constantly want to know more and be willing to question convention to be truly successful. Halsey: The ability to be meticulous when trying to solve a problem and truly consider all options before proceeding. Steadfast patience, unbound creativity, and a willingness to ask for help are also musts. 5. What do you get out of engineering or design that you couldn’t get from any other kind of work? Jesse: Design allows me to have fun at work while simultaneously exercising my mind and learning new things every day. Halsey: Project diversity. Other industries are often limited to doing business only within their industry, but software engineers do business with all of them. Jesse: The re-architected government website from Question #2! Halsey: Building a GUI with Java swing. ‘Nuff said. Halsey: Getting to work on tons of different projects and learning about and being a part of continuously evolving technologies alongside interesting and creative people. Jesse: I’m constantly on Dribbble peeking at what other designers are up to and looking for inspiration. As far as individuals go, Frank Chimero’s and Claudio Guglieri’s writing and design work come to mind. Halsey: I’ve recently been listening to podcasts such as StarTalk with Neil Degrasse Tyson, and TED talks are always a great source of learning and inspiration. For coding, I would not be where I am now without Udemy and trusty StackOverflow. The more knowledge the better! Jesse: A George Foreman grill. Those things are handy! Jesse: A T-1000 terminator that knows how to design. Or, bots with machine learning. Halsey: Augmented reality. Because who doesn’t want to have Tony Stark’s basement! 11. If you weren’t an engineer or designer, what occupation would you choose? Halsey: Martial arts coach or university professor. Jesse: Time with family and loved ones. Halsey: Being out in nature 24/7/365 and still doing software engineering through augmented reality.